a device used by musicians that marks time at a selected rate by giving a regular tick. This training is not designed to be a difficult course. It is designed to train your ear to learn to play perfectly in sync with a metronome. The metronome is a tool used to identify the “tempo” (speed) of a song, to help prevent speeding up, dragging, and to tighten our individual playing and playing as a team. This course is designed for all skill levels and will reinforce basic concepts, cover music theory, and will help in preparing you to successful play with a metronome during group rehearsal times. Each day, you will get a reminder text with a link to a mini lesson teaching the topic of the day, a worship song sheet from our current repertoire, and step by step instructions on how to practice the metronome with your instrument for that day. It also may include a sound clip, short video, or other instructing materials. Expect to spend between 15-20 minutes for each day’s assignment. Do your best to complete each day’s course, as all of the concepts build on previous lessons. Also, it is to your benefit to not skip over exercises or teachings! If you regularly are scheduled to play multiple instruments, please try to practice with both of them! Vocalists, this is applicable to you too! Where an instrument would strum or play a note, you can clap the beat and/or sing the beat. While practicing with a worship song, try and sing the whole song while using the metronome. By the end of these 14 days, we do not expect you to be an expert at playing with a steady beat. However, our goal is for all of us to become comfortable in our individual practice times playing with a metronome, in order to more successfully play together in corporate rehearsal times. By practicing theory and simple musical exercises, we are developing the thinking behind the playing. The level of excellence we strive for in our individual practice will overflow into our time playing together as a team! Time Signature- an indication of rhythm written in fraction form. The top number indicates how many beats arein each measure. The bottom number defines which note equals one beat. Subdivision- How each beat is divided. Song Duration-How long your metronome will play. Measured by musical bars (measures) or minutes. Start and stop by the touch of the triangular button. Easily change time signature, subdivision, and duration with the touch of the button. Change the BPM by turning the knob, which provides the tempo name above the BPM number. Tap button allows you to tap in a tempo without needing to know the exact BPM. Change the accent of the beat by tapping the “set of three box” that lights up when the metronome plays. In the song library, create a set beat and set up to practice to a specific song. In the set list library, create a specific order of songs (for example, songs for your Thursday practice) from your song library. Load your song or set lists that you prepared in the library to your metronome. When loaded, return to compose and your metronome will be programmed to play the beats your songs were created at. Although we don’t see this in our chorded sheet music, each chord change represents a number of beats that we are holding or playing each note/chord. Today we will explore whole and half notes. In the time signature 4/4 (the time signature most commonly used, also called “common time”), a whole note gets 4 beats and a half note gets 2 beats. Today’s practice may seem simple; it is not intended to be a difficult task. Its purpose is to begin training your ear to play with a click track in the background and to focus on playing EXACTLY on the down beat, every single time. Play whole notes (four count beats) on the downbeat (first beat), switching between only 2 chords. Play half notes (2 count beats) on the 1st and 3rd beat, switching between only 2 chords. Play a variety of half notes and whole notes, switching chords as often as desired. Looking at the sheet music “What a Beautiful Name” (see below), can you identify for one verse and one chorus which chords should represent a whole note and which should represent a half note? If you cannot do it by looking at the music, can you use your metronome to help identify them? Set your metronome to 67bmp, 4/4 time signature, quarter subdivisions, and turn off song duration. Play through the song “What a Beautiful Name”, taking caution to have every chord land directly on the beat it should. Yesterday, we learned that the whole note gets four beats and the half note gets two beats. Two other common notes are the quarter note and the dotted half note. The quarter gets one beat and the dotted half gets three beats. It is important to understand note values in order to fully comprehend time signatures. As previously mentioned, the top number of the time signature represents how many beats per measure and the bottom, which note equals one beat. In our common time signature, 4/4, there can only be four beats in every measure, and the four on the bottom tells us the quarter note equals one beat (because it equally divides into a whole note four times). Other familiar time signatures we see are 2/4 and 3/4. The quarter note still equals one beat, but instead of four beats per measure, we are limited to two or three beats. Today you will be exploring playing with different time signatures and rhythm combinations. Play quarter notes (one beat), changing chords/notes every measure (every 3 beats). Begin playing half notes (two beats), then after a minute switch to quarter notes (1 beat). Switch chords/notes when desired. Begin by listening to these two versions of Amazing Grace (see below). Can you identify which song has a 3/4 time signature and which song has a 4/4 time signature? Set your metronome to 3/4 time signature, quarter note subdivision, and 85bpm. Play the song “Amazing Grace” three times (provided below). Try and identify which type of note is represented by each chord (quarter note, half note, dotted half note). So far we have covered the four basic notes used in music. The quarter note (1 beat), half note (2 beats), dotted half note (3 beats), and whole note (4 beats). Each of these get a full value and are fairly simple to count in music. Today, we are exploring subdividing our notes, or notes that get less than a value of 1 (notes shorter than 1 beat). One eighth note gets half the value of a quarter note, or half a beat. Often they are grouped together in twos. Two eighth notes equal one beat. Furthermore, sixteenth notes subdivide down to four in every beat, or four per quarter note. When counting beats, quarter notes are the most simple, because they represent one. But when we begin to subdivide, it can become more difficult to dictate where the beat lands. When we count quarter notes or any other full value note, we can count “1,2,3,4”. But when we break down our beats to half of a beat (eighth notes), they can be counted “1 and 2 and 3 and 4 and”. Furthermore, when we break down our beats to a quarter of a beat (sixteenth notes), they can be counted, “1 e and a 2 e and a 3 e and a 4 e and a”, each word/sound representing a note (see examples below). Listen to track for verbal count. Play eighth notes (two beats per click). Change chords/notes every two beats. Play sixteenth notes (every click). Change chords/notes every 2 bars. The song “You Came” can often feel like a “fast” driving beat, when in reality the BPM is only 76 (a fast walking pace). This is because the song is full of eighth notes and sixteenth notes. If you are unfamiliar with your instruments part in the song, set your metronome to 4/4 time signature, quarter note sub division, and 76 BPM. Listen to the beat, and then pull up the song “You Came” by the Helser’s. (See below). Try and identify where the eighth notes and sixteenth notes are within the song. Using the sheet music attached, play though “You Came” with your metronome set to 76bpm. Use the subdivision that you find to be easiest for this song (quarter, eighth, or sixteenth). Session 5 - Practice makes perfect! Today is we will review the notes we have learned. Go back and look through lessons 2, 3, and 4. Choose 2-3 exercises you found challenging or want to fine tune. If you feel confident in your ability to play them all, it is still good practice listening to the metronome while playing. Remember, we are not trying to accomplish playing complex rhythms and beats while using the metronome. We are working on training your ear to listen for the beats and to play exactly with them. You can add to the difficulty by changing notes/chords more frequently. Log into Planning Center and choose one of your favorite songs. Input the BMP into your metronome, choose the subdivision you’d like to practice with, and play through the song! Now that we have learned the foundation and the most common notes in music, it’s time to break the rules! Although the core music theory that we learn won’t often change, occasionally there are exceptions to the rules. Today we will explore ‘triplets’ in a time signature where the denominator is 4 (2/4, 3/4, 4/4). Although there are several types of triplets, today we will explore the most common, the eighth note triplet. This triplet has three eighth notes that fit into 1 beat, or one quarter note. As we have recently learned, an eighth note gets 1⁄2 a beat. Therefore, two of them ( 1⁄2 + 1⁄2 ), equal one quarter note. It is counted “1 and 2 and”. However, when we add a third eighth note in the grouping with a “3” on top (which indicates it is a triplet), we now have three eighth notes that need to fit into 1 beat, or one quarter note (essentially breaking the beat down to 1/3+1/3 +1/3 ). A triplet is counted “tri-pl-et”. Listen to the sound clip below to hear an 131313 example of how to count them each correctly. Can you VERBALLY say tri-pl-et along with the metronome? The “tri” should be said on the higher pitch. Can you VERBALLY say tri-pl-et along with the metronome, with only hearing the quarter note beat? Can you clap the rhythm provided below with your metronome? If you are having difficulty, can you continue to write out the beats/wording below it? Try and use your metronome to help keep a steady beat. If you think you have the rhythm correct, practice it for 6 bars in a row. Below is a sound clip with the rhythm clapped and said for you. DO NOT open the sound clip until you have spent time working through it yourself! Triplets are found in our worship music often, but can be difficult to play individually and tightly as a band. One popular song that uses triplets is “Ever Be” (see chord chart below) you will see the bridge and the beats dictated above.  With your metronome set to 70 BPM, quarter note subdivision, can you play the bridge tightly, and exactly on beat? Listen to attached sound clip “Day 6- Application” to hear an example of how it should sound.  Once you are successful with the bridge, open the attached “Ever Be” sheet music and play through the whole song with your metronome set to 70bpm. Through lesson 6, we have focused our time on learning how to identify and play different rhythms and notes. Today our lesson is two-fold. We are going to learn rests (when we mute on our instruments) and how to read a given rhythm and practice it with the metronome. Now that you have a better understanding of our notes, it is very easy to learn all of the musical rests. Essentially, each note has a paired rest that has the same value and name, but instead of playing during that time, we are resting, or muting, our instruments. So the quarter note, which gets 1 beat, also has a quarter rest, where we rest/mute for one beat. Simple! 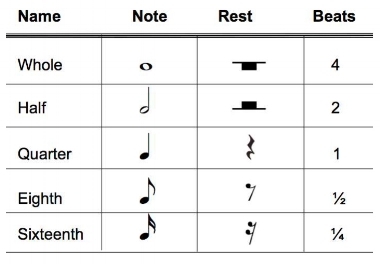 Below you will see a chart of the notes and their corresponding rests. First, I identified where each beat landed (in red). Then using my knowledge from lessons 4 and 6, I added the strategies of how to count the notes that do not have whole beats (in blue). Now I can count and clap this rhythm easier. Listen to the sound clip below. Before you use your metronome, can you clap this rhythm below? If you think you have learned it correctly, try clapping it with your metronome. Once you feel you know the rhythm, play it with your instrument for one minute. If you think you have learned it correctly, try clapping it with your metronome. Below you will find a slightly simplified rhythm for the introduction to “Yes and Amen”. Even though we have yet to cover some of the musical elements and notes below, you should be able to see which chord lands on each beat. Take a moment to clap the rhythm below. Set your metronome to 76 BPM, 4/4 time signature, subdivision eighth notes, for one minute. Play the introduction, taking care to strongly hit beat 1 and the & of 2. 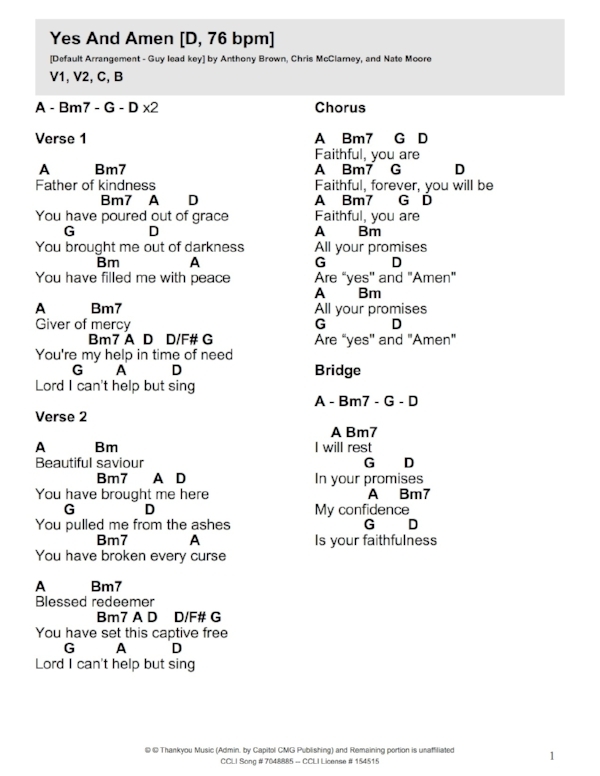 See chord chart below for Yes and Amen and play though the entire song with your metronome. Previously, we learned that time signatures represent how many beats per measure (the top number), and what type of note equals 1 beat (the bottom number). So far we have explored time signatures 2/4, 3/4, and 4/4, all with a 4 as the denominator. Remember, the 4 on the bottom tells us that the quarter note will equal one beat. But what happens when we change the denominator to another number? All of our note values change! The other most common time signature, and sometimes most difficult to play or decipher, is the 6/8 time signature. We know that the 6 on top tell us that there will be 6 beats in each measure, but what does changing the 4 (4/4) to an 8 (6/8) mean for our notes? It now means that the eighth note no longer equals half a beat, but instead equals 1 beat! Which means our quarter note now equals two beats! Each of our note values have doubled. Although the reasoning is slightly complicated, one of the easiest ways to decipher the difference between a time signature with a 4 denominator and a 6 denominator is to “feel the beat”. If you can march steadily to the beat, that’s a good indicator it has a 4 time signature. If you can swing, or sway to the beat, it is probably an 8 time signature. We will learn next lesson the theory behind why that is. There are two ways to use your metronome to practice 6/8. The first is to set the time signature to 6/8. However, you must remember that 6/8 needs the “swing” feeling, which is produced by accenting beats 1 and 4 (remember you can change the click tones to hear a different pitch on beat 1 and 4). However, it can be hard to hear the swing with a straight click sound. A second way to practice is to set your metronome to 2/4, and to say/play “1, 2, 3” for click one then “4, 5, 6” for click two. Listen to the sound clip below “Day 9-Practice” to hear examples of this. Set your pitch on the click to have beats 1 and 4 a different pitch. VERBALLY, count “1 2 3” to the first beat, and “4 5 6” to the second beat for 10 bars. Play eighth notes making sure that beat 1 lands on the first click, and beat 4 lands on the second click. 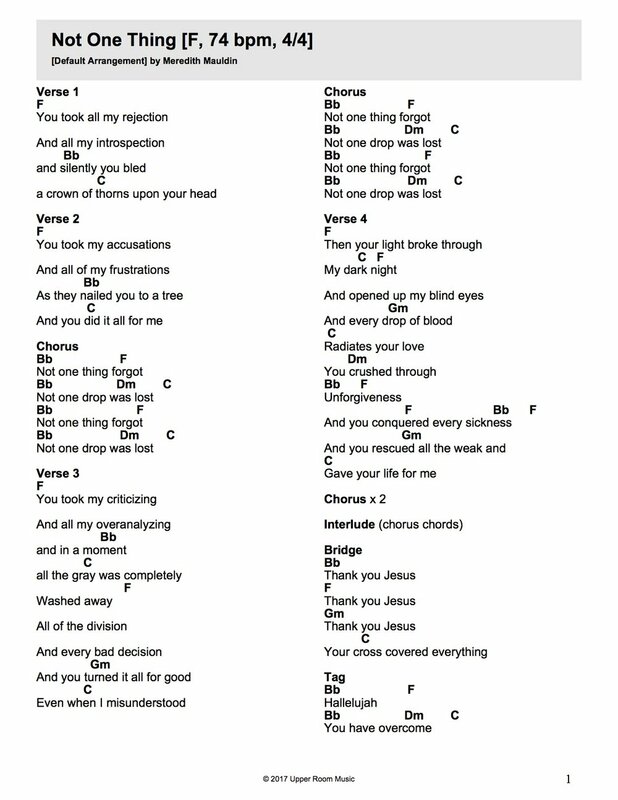 Play the attached song, “Great Are You, Lord” with your metronome. Take care to not speed and make sure your 1 and 4 beats always hit the right beat! Learning to play 6/8 with a metronome can be challenging. It is very easy to speed up a song that has a time signature 6/8, but learning to play successfully with a metronome can help prevent that. Yesterday we learned that with a 6/8 time signature, that all of our note values are doubled. An eighth note no longer equals 1⁄2 a beat, but rather 1 full beat. This leads us to two important notes that we have yet to cover in relation to 6/8 time signature; the dotted quarter note and the sixteenth note! Below you will find examples on how to count dotted quarter notes in different time signatures. Below you will find examples on how to count 16th notes in different time signatures. Sometimes subdividing to sixteenth notes on our metronome will aid in learning certain songs. Before you use your metronome, can you clap this rhythm below? Once you feel you know the rhythm, play it with your instrument for two minutes. Play a rhythm of your choice in 6/8, taking careful consideration to stay exactly on the beat. Sometimes it can be difficult to transition between two different time signatures in a set list. Below you will find the songs, “Great are you, Lord” and “King of My Heart”. Great are you, Lord has a 6/8 time signature and King of My Heart has a 4/4 time signature. You will be practicing as if you are finishing the song, “Great are you Lord”, and beginning the song, “King of My Heart”. Set your metronome to 2/4 time signature, quarter note subdivision, 50bpm for “Great are you Lord”, then up the BPM to 68 for “King of My Heart”, keeping the time signature and subdivision the same. Remember, there are only 2 clicks! For the first song in 6/8, you will count 1 2 3 4 5 6, with 1 and 4 landing on the clicks. For the second song in 4/4, each click will be beats 1, 2, 3, 4. Try to leave as little time between the transition as possible! We’ve all seen it. Maybe we’ve even contributed to the problem (there is forgiveness for this). Or even worse, you are clueless this even happens (don’t worry, we are here to teach you). 6/8 and 3/4 time signatures are practically the same, right? They are interchangeable! NO. NO. NO THEY AREN’T. This is one of the most difficult confusions to sort out when presented a song in 6/8 time signature that sounds like it is 3/4 time signature. It comes down the “meter” of the song. A meter in music is, “a reoccurring pattern of stresses or accents that provide the pulse or beat of music” (dictionary.onmusic.org). The meter or accents of the beats for 6/8 will fall in different places than in 3/4. Above you see two measures, both with 6 eighth notes. We could play these exactly the same, correct? No! Because like we’ve learned, 6/8 time signature accents beats one and four. 3/4 time signature accents beats one, two, and three. To dive even deeper into theory, when groupings of notes must be divided by 3, the meter is called “compound”. When divided by 2, the meter is called “simple”. So although these two measures have the exact same notes, they must be divided differently, which produces a different rhythm or feel. signatures, play steady eighth notes. You will be playing four bars of 6/8, then four bars of 4/4 without a break. Listen to Session 11 Exercise 3 sound clip for an example. There are not many worship songs nowadays that are written in 3⁄4 time signature. Most commonly you will find those songs to be Christmas songs and Hymns. It is now more popular to write songs in 6/8 time signature. Attached you will find the sheet music for and . (If you are unfamiliar with the song, “Stronger”, find the link below and ). “Stronger” is in 3/4 time signature and “Jesus we Love You” has a 6/8 time signature. Listen to “Stronger” and try to identify a measure where you can clearly hear three solid beats. This song also has a distinct marching feel to it. 2/4 time signature, 58bpm, quarter note subdivision, and play through “Jesus We Love You”. Remember to count 1, 2, 3 for click one and 4, 5, 6 for click two. We have spent the last several days learning be able to read and then play dictated music that you have been provided. But what about the opposite skill, being able to dictate the music that you hear? Today we will explore tips on how to decipher and write out simple rhythms. The first step is to identify the time signature. A majority of songs will either be 2/4, 3/4, 4/4, or 6/8. You can begin by rulingout6/8,andthenlistenforhowmanyfullbeatsyouhearplayed.Canyoucount,“1,2,3,4”initsentirety? Then you have 4/4. Continue to eliminate until you are certain of your time signature. The second step is to try and identify which type of notes you hear. Are there quarter notes? Half notes? Several eighth or 16th notes? Do you hear syncopated rhythms (which we will not be covering). Take note of the types of notes you think you hear. Thirdly, you need to identify where beats 1, 2, 3... and so on. Can you rule out beats 1, 2, because they are quarter or half notes? Start with your whole beats. Lastly, is there a beat that has two, three or four notes? Can you break down and write out just that one beat? Do you hear a triplet? Are there four notes in a beat (that would most likely be four 16th notes). Once you believe you have written the measure properly, clap out what you wrote and see if it matches with what you hear. If so, you have successfully dictated music! This is called “melodic dictation” and is a very difficult skill to develop! Below you will find a reference for the types of notes we have learned and their beats based on time signature. For today’s exercises, you will open a sound clip, listen to the rhythm, dictate it, double check it, then set your metronome accordingly and practice it! Each exercise will be simple rhythms and should not be too difficult. Using a pen and paper will help in working through the process. The answers will be provided in a separate file. DO NOT open it until you have done your best to hear and dictate it yourself! Listen to the attached sound clip “Session 12-Exersise 1”, dictate it, and then practice it for one minute. Listen to the attached sound clip “Session 12-Exersise 2”, dictate it, and then practice it for one minute. Listen to the attached sound clip “Session 12-Exersise 3”, dictate it, and then practice it for one minute. You may be wondering how this skill can be useful in our corporate rehearsal times. Take the song ,“Joyful Joyful” for example. It is a very complex rhythmic song, with a driving fast tempo. If the entire band is not EXACT with their rhythms, it would sound like a mushy mess. However, if everyone could tighten their sound to be one, the song produces a beautiful sound and rhythm. By taking the time to dictate a rhythm, you ensure that everyone learns the exact same thing, rather than “feeling the song” which can sometime not be accurate. Below you will see part of the sheet music of, “Joyful Joyful”. Listen to the audio clip below, at 4 minutes 30 seconds until you hear the chorus. To some, they may think that the chords land on 1 and 3. When in fact, the chords actually land on beats 1 and the & of 2! Although just a half beat difference, it would make ALL the difference when hearing everyone play the same thing. After listening to the clip, set your metronome to 115bpm, 4/4, quarter subdivision, 1 minute song duration. Practice the chorus as written below. We have spent the last couple of weeks learning music theory and practice skills for using the metronome successfully. If we look back at lesson 1, we stated our goal was to become comfortable in our individual practice times playing with a metronome, in order to more successfully play together in corporate rehearsal times. This is not a skill that is met and then never revisited again. Our personal practice time playing with a metronome should be on a regular basis! The more comfortable we get with it, the more challenging of rhythms and music we can learn. Take a look at your app “The Metronome” by Soundbrenner. We have spent all of our time in the “compose mode” learning how to use the aspects of the metronome itself. Today we will explore how to add songs and set lists for personal practice times! At the bottom of the app, click Library, then song library. Click Create Song, and type in the song and metronome information that you’d like it to save. You can do this for all of the songs you’d like to practice. After you have completed entering your songs, you can go to Library, Setlist Library where you can then order your songs to play for you back to back! Once you have completed loading your information into the library, click player at the bottom menu, and then load at the top of the app. Here you can choose to load your set list or a specific song into you metronome! No longer will you have to re-enter that information when you want to practice that song again! When successfully loaded to the player, you can just use the arrows that appear to scroll through your set list! Look back over the last couple weeks of lessons. Choose 3 exercises that you found difficult or know that you could fine tune. Are they easier now that you are nearing the end of the two week course? As we begin to implement playing with a metronome in our in-ear monitors, it’s important that during your personal practice times, you are playing the sets you need to learn with the metronome. Corporate rehearsal times are not the time for you to learn how to play a song well with a metronome. That should be learned in personal practice times. Corporate rehearsal times are designed to learn to play well with others while implementing the metronome to aid in that process. Attached to your e-mail you will find four worship songs for a “practice” worship set. Enter them into your song library and build a setlist with them (following the instructions in the lesson above). Below you will find your set list: Get Your Hopes Up, 10000 Reasons, Yes and Amen, & Not One Thing. Play through a shortened version of your set using the metronome.